Eukaryotic microorganisms possess membrane-bound cell organelles and include fungi and protists, whereas prokaryotic organisms—all of which are microorganisms—are conventionally classified as lacking membrane-bound organelles and include Bacteria and Archaea. Microbiologists traditionally relied on culture, staining, and microscopy. However, less than 1% of the microorganisms present in common environments can be cultured in isolation using current means. Microbiologists often rely on molecular biology tools such as DNA sequence based identification, for example 16s rRNA gene sequence used for bacteria identification. Avicenna hypothesized the existence of microorganisms. 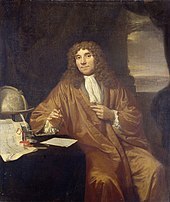 In 1676, Antonie van Leeuwenhoek, who lived most of his life in Delft, Holland, observed bacteria and other microorganisms using a single-lens microscope of his own design. He is considered a father of microbiology as he pioneered the use of simple single-lensed microscopes of his own design. While Van Leeuwenhoek is often cited as the first to observe microbes, Robert Hooke made his first recorded microscopic observation, of the fruiting bodies of moulds, in 1665. It has, however, been suggested that a Jesuit priest called Athanasius Kircher was the first to observe microorganisms. The field of bacteriology (later a subdiscipline of microbiology) was founded in the 19th century by Ferdinand Cohn, a botanist whose studies on algae and photosynthetic bacteria led him to describe several bacteria including Bacillus and Beggiatoa. 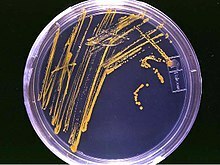 Cohn was also the first to formulate a scheme for the taxonomic classification of bacteria, and to discover endospores. Louis Pasteur and Robert Koch were contemporaries of Cohn, and are often considered to be the father of microbiology and medical microbiology, respectively. Pasteur is most famous for his series of experiments designed to disprove the then widely held theory of spontaneous generation, thereby solidifying microbiology's identity as a biological science. One of his students, Adrien Certes, is considered the founder of marine microbiology. Pasteur also designed methods for food preservation (pasteurization) and vaccines against several diseases such as anthrax, fowl cholera and rabies. Koch is best known for his contributions to the germ theory of disease, proving that specific diseases were caused by specific pathogenic microorganisms. He developed a series of criteria that have become known as the Koch's postulates. Koch was one of the first scientists to focus on the isolation of bacteria in pure culture resulting in his description of several novel bacteria including Mycobacterium tuberculosis, the causative agent of tuberculosis. While Pasteur and Koch are often considered the founders of microbiology, their work did not accurately reflect the true diversity of the microbial world because of their exclusive focus on microorganisms having direct medical relevance. It was not until the late 19th century and the work of Martinus Beijerinck and Sergei Winogradsky that the true breadth of microbiology was revealed. Beijerinck made two major contributions to microbiology: the discovery of viruses and the development of enrichment culture techniques. While his work on the tobacco mosaic virus established the basic principles of virology, it was his development of enrichment culturing that had the most immediate impact on microbiology by allowing for the cultivation of a wide range of microbes with wildly different physiologies. Winogradsky was the first to develop the concept of chemolithotrophy and to thereby reveal the essential role played by microorganisms in geochemical processes. He was responsible for the first isolation and description of both nitrifying and nitrogen-fixing bacteria. French-Canadian microbiologist Felix d'Herelle co-discovered bacteriophages in 1917 and was one of the earliest applied microbiologists. The branches of microbiology can be classified into pure and applied sciences, or divided according to taxonomy, as is the case with bacteriology, mycology, protozoology, and phycology. There is considerable overlap between the specific branches of microbiology with each other and with other disciplines, and certain aspects of these branches can extend beyond the traditional scope of microbiology A pure research branch of microbiology is termed cellular microbiology. A variety of biopolymers, such as polysaccharides, polyesters, and polyamides, are produced by microorganisms. Microorganisms are used for the biotechnological production of biopolymers with tailored properties suitable for high-value medical application such as tissue engineering and drug delivery. Microorganisms are for example used for the biosynthesis of xanthan, alginate, cellulose, cyanophycin, poly(gamma-glutamic acid), levan, hyaluronic acid, organic acids, oligosaccharides polysaccharide and polyhydroxyalkanoates. ^ Whitman, Whilliam B (2015). Bergey's Manual of Systematics of Archaea and Bacteria. John Wiley and Sons. CiteSeerX 10.1.1.737.4970. doi:10.1002/9781118960608. ISBN 9781118960608. ^ Pace, Norman R. (2006). "Time for a change". Nature. 441 (7091): 289. doi:10.1038/441289a. ISSN 0028-0836. PMID 16710401. ^ Nitesh RA, Ludwig W, Schleifer KH (2011). "Phylogenetic identification and in situ detection of individual microbial cells without cultivation". Microbiological Reviews. 59 (1): 143–169. PMC 239358. PMID 7535888. ^ Rice G (2007-03-27). "Are Viruses Alive?". Retrieved 2007-07-23. ^ Jaini, Padmanabh (1998). The Jaina Path of Purification. New Delhi: Motilal Banarsidass. p. 109. ISBN 978-81-208-1578-0. ^ Marcus Terentius Varro. Varro on Agriculture 1, xii Loeb. ^ "فى الحضارة الإسلامية - ديوان العرب" [Microbiology in Islam]. Diwanalarab.com (in Arabic). Retrieved 14 April 2017. ^ Dobell, Clifford (1932). Antony van Leeuwenhoek and His "Little Animals": being some account of the father of protozoology and bacteriology and his multifarious discoveries in these disciplines (Dover Publications ed.). New York: Harcourt, Brace and Company. ^ Ford, Brian J. (1992). "From Dilettante to Diligent Experimenter: a Reappraisal of Leeuwenhoek as microscopist and investigator". Biology History. 5 (3). ^ a b Lane, Nick (6 March 2015). "The Unseen World: Reflections on Leeuwenhoek (1677) 'Concerning Little Animal'". Philos Trans R Soc Lond B Biol Sci. 370 (1666): 20140344. doi:10.1098/rstb.2014.0344. PMC 4360124. PMID 25750239. ^ Gest H (2005). "The remarkable vision of Robert Hooke (1635-1703): first observer of the microbial world". Perspect. Biol. Med. 48 (2): 266–72. doi:10.1353/pbm.2005.0053. PMID 15834198. ^ a b c d Wainwright, Milton (2003). An Alternative View of the Early History of Microbiology. Advances in Applied Microbiology. 52. pp. 333–55. doi:10.1016/S0065-2164(03)01013-X. ISBN 978-0-12-002654-8. PMID 12964250. ^ Drews, G. (1999). "Ferdinand Cohn, among the Founder of Microbiology". ASM News. 65 (8): 547. ^ Ryan, K.J. ; Ray, C.G., eds. (2004). Sherris Medical Microbiology (4th ed.). McGraw Hill. ISBN 978-0-8385-8529-0. ^ Bordenave, G. (2003). "Louis Pasteur (1822-1895)". Microbes Infect. 5 (6): 553–60. doi:10.1016/S1286-4579(03)00075-3. PMID 12758285. ^ Adler, Antony; Dücker, Erik (2017-04-05). "When Pasteurian Science Went to Sea: The Birth of Marine Microbiology". Journal of the History of Biology. 51 (1): 107–133. doi:10.1007/s10739-017-9477-8. PMID 28382585. ^ Johnson, J. (2001) . "Martinus Willem Beijerinck". APSnet. American Phytopathological Society. Archived from the original on 2010-06-20. Retrieved May 2, 2010. Retrieved from Internet Archive January 12, 2014. ^ Paustian T, Roberts G (2009). "Beijerinck and Winogradsky Initiate the Field of Environmental Microbiology". Through the Microscope: A Look at All Things Small (3rd ed.). Textbook Consortia. § 1–14. ^ Keen, E.C. (2012). "Felix d'Herelle and Our Microbial Future". Future Microbiology. 7 (12): 1337–1339. doi:10.2217/fmb.12.115. PMID 23231482. ^ Lister, Joseph (2010-08-01). "The Classic: On the Antiseptic Principle in the Practice of Surgery". Clinical Orthopaedics and Related Research. 468 (8): 2012–2016. doi:10.1007/s11999-010-1320-x. PMC 2895849. PMID 20361283. ^ "Branches of Microbiology". General MicroScience. 2017-01-13. Retrieved 2017-12-10. ^ Brock Biology of Microorganisms (14th ed.). ISBN 978-0321897398. ^ Burkovski A (editor). (2008). Corynebacteria: Genomics and Molecular Biology. Caister Academic Press. ISBN 978-1-904455-30-1. Retrieved 2016-03-25. ^ Fourmy, Dominique; Recht, Michael I.; Blanchard, Scott C; Puglisi, Joseph D. (1996). "Structure of the A site of Escherichia coli 16S ribosomal RNA complexed with an Aminoglycoside Antibiotic" (PDF). Science. 274 (5291): 1367–1371. Bibcode:1996Sci...274.1367F. doi:10.1126/science.274.5291.1367. PMID 8910275. Retrieved 2016-04-05. ^ Rehm BHA (editor). (2008). Microbial Production of Biopolymers and Polymer Precursors: Applications and Perspectives. Caister Academic Press. ISBN 978-1-904455-36-3. Retrieved 2016-03-25. ^ Diaz E (editor). (2008). Microbial Biodegradation: Genomics and Molecular Biology (1st ed.). Caister Academic Press. ISBN 978-1-904455-17-2. Retrieved 2016-03-25. ^ MacFarlane, GT; Cummings, JH (1999). "Probiotics and prebiotics: Can regulating the activities of intestinal bacteria benefit health?". BMJ: British Medical Journal. 318 (7189): 999–1003. doi:10.1136/bmj.318.7189.999. PMC 1115424. PMID 10195977. ^ Tannock GW, ed. (2005). Probiotics and Prebiotics: Scientific Aspects. Caister Academic Press. ISBN 978-1-904455-01-1. Retrieved 2016-03-25. ^ Wenner, Melinda (30 November 2007). "Humans Carry More Bacterial Cells than Human Ones". Scientific American. Retrieved 14 April 2017. ^ Mengesha; et al. (2009). "Clostridia in Anti-tumor Therapy". Clostridia: Molecular Biology in the Post-genomic Era. Caister Academic Press. ISBN 978-1-904455-38-7.